After three years and expert input from the community, I joined the Glassell Park , Neighborhood Council, Chamber of Commerce and the Improvement Association to break ground on a mixed-use development for the former Masonry Builders Supply site. This long neglected strip of land between Eagle Rock Boulevard and the Glendale Freeway has been re-imagined with a contemporary design that will house four retail pads and 114 housing units, some of which will be affordable. This project, once scouted as a potential McDonalds, came about as the community worked with my office to find a developer with the vision for a sustainable project capable of supporting growth in the area. 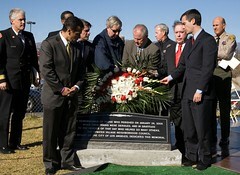 The community's input was a valued component of the developer's plans. As a result of this partnership, the project will feature a signalized pedestrian crosswalk across Eagle Rock Blvd. and a number of other community-friendly attributes. I presented my annual State of Hollywood Address to the Hollywood Chamber of Commerce today. It's an honor to be given such a great platform every year to go over the challenges we've faced, the challenges we will face, and the challenges we must not shrink from. I won't reproduce the whole speech here—please read the whole thing on the Chamber's website or on my Speeches page. However, let me share one observation I made while drafting the speech that I didn't manage to fold into it. We talk a lot about the golden age of Hollywood, and people who lived through its serious decline often refer back to the 1950s as a kind of "golden age". And there was a lot more business in Hollywood then, as well as more radio and television production than we've had until recently. But the stars themselves haven't actually lived in Hollywood since probably as far back as the 1920s. That's changing, especially with the adaptive reuse projects that are going in on the various corners of Hollywood and Vine. With our menu of music, food, movies, live entertainment, and our burgeoning office and general day-life presence, it's as golden an age as we've ever had. Hollywood's done much more than come back. In 2007, as we assess the state of Hollywood and the city beyond, we also stand at a uniquely bright moment in our history. We have the lowest crime we’ve known since 1956. We have the lowest unemployment rate since 1976. And we are in the strongest financial shape of any big city in the country. Taken together, these three things are the foundation for our prosperity. But what will we do with that prosperity? And while Father Juan Crespi’s Los Angeles Mission was never built brick by brick, we now ask how will we build our mission, block by block. I joined City Attorney Rocky Delgadillo and Chief Bratton to shut down a house in the Drew-Estara neighborhood that had been used for drug dealing. The order was declared under Rocky's T.O.U.G.H. 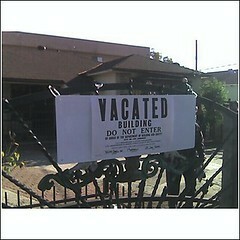 program, a part of the Citywide Nuisance Abatement Program, or CNAP. This neighborhood has had a hard time of it. My office has worked there continually since I came to office in 2001. I've organized folks to go door-to-door, making sure people know about city services to push back against gang activity and nuisance activity in general. Everyone has the right to walk safely down his or her own street. Every mother has the right to send her child outside to play without her hearts leaping into her throat at the sound of a truck backfiring. My promise to the Drew-Estara neighborhood is that we will use all the tools in our toolkit to protect those rights. Special thanks go to Nick Karno, who has done remarkable work in the neighborhood under Rocky's neighborhood prosecutor program. It was just about two years ago that the residents of Atwater Village and Glendale endured an unimaginable tragedy. A MetroLink train derailed near the Costco on Los Feliz Boulevard, taking 11 lives and injuring more than 100. I joined Mayor Antonio Villaraigosa, Councilmember Tom LaBonge, Sheriff Lee Baca and others at that spot to commemorate the terrible tragedy and the courageous efforts of that day. As the simple memorial was revealed and we stood in collective silence, I recalled the heroism of the nearby Costco workers, who rushed to the scene to pull passengers out of the train even as it threatened to fall over with them inside. I remembered the bravery of the Fire Department, whose efforts to extinguish the fire in the engine car saved dozens of lives. I stood once again astounded by the inter-agency coordination, an essential part of the rescue effort that shone in our moment of crisis. And I once again felt the smallest idea of the pain of family members who forever lost loved ones in that instant. In this moment of horror, we saw the best in ourselves and of each other. May the bravery and heroism of the first responders leave as indelible of a mark upon our city as the tragedy of losing our brothers and sisters that morning. Originally uploaded by CD-13 from the LAPL collection. I've asked the incomparable LA City Nerd to apply his or her nerderific Los Angeles knowledge to an occasional guest post to the CD13 blog. Please enjoy this rich and robust take on a figure who shaped physical Hollywood like none before or since. Before Hollywood meant celebrities and film reels, there was the Cahuenga Valley and Colegrove that gave way to a community called Hollywood. Before the Walk of Fame and the movie premieres and footprints in cement, there was the building of a city that was Hollywood. And who drove this development? Aside from Wilcox and Cole who started things out, it was Charles Edward Toberman who is credited with building Hollywood into what is known worldwide today. From commercial stores to homes and from movie studios to movie theaters, C.E. Toberman did it all. Credited with building 29 commercial structures over 70 years, he is known as the most prolific developer in Hollywood. The oldest retail building on Hollywood Boulevard today, at 6410 Hollywood Boulevard (the former "Woolworth Building"), was a Toberman building. In fact, 6780 Hollywood Boulevard was known as the CE Toberman Building, the site of his first office in a previous building than what now exists (Ripley's Believe it or Not). Toberman was born in 1880 and was the nephew of two-time Mayor James R. Toberman (whose house in Hollywood, a City-designated historic-cultural landmark on Harvard just north of Hollywood Boulevard in CD4, was next door to Charles Toberman's house). He moved from Texas to Los Angeles in 1902 (or 1905 - there is some discrepancy) with his wife and $30. He opened an insurance and real estate firm in 1907 in an office at the above mentioned Hollywood & Highland location, when Hollywood Boulevard was known as Prospect Boulevard (his office was actually at 1717 N. Highland Ave.). He served as an appointed City Treasurer when Hollywood was its own municipality in 1909 and chair of the executive committee to fully establish the Hollywood Bowl we know today in 1923 and served as the president of the Hollywood Bowl Association for more than 30 years. Toberman was known for building large concrete buildings, which were poured in place using steel re-bar, making them extremely strong. Sometimes, the concrete was poured up to three feet thick. He was also known for creating decentralized shopping centers, choosing locations that were considered "outside of town" to group commercial buildings. He acted as a one-man CRA, taking older buildings and replacing them with newer, modern structures that added to the vitality of the area. He was the living example of free enterprise, and his 1971 biography held that title: "Free Enterprise: Foundation of America's Greatness." Some of the other buildings and developments Charles E. Toberman is credited with are the Hollywood Center Studios on Las Palmas, Hollywoodland residential development, Outpost Estates, residential tracks in the Valley & Fairfax District, the Chinese Theatre, El Capitan Theatre, the Roosevelt Hotel, the Bekins Building, the Kress Department Store (Frederick's of Hollywood), and the The Hollywood Fire and Safe Building (the Max Factor Building). Now, if you walk along Hollywood Boulevard and are awed by the landmarks that define one of the most famous streets in the world, you'll understand why in 1972, Charles E. Toberman, at 92 years old, was still known as "Mr. Hollywood." If you stop on that walk at the First National Bank of Hollywood Building (northeast corner of Hollywood & Highland),you can see a plaque that was installed there in his honor by the Hollywood Chamber of Commerce for his vision in making Hollywood what it was in 1972. And today, he still holds that title of "Mr. Hollywood" as his legacy still defines the City street that defines the idea of Hollywood to the world. enterprise, began to build Hollywood! C.E. Toberman lived to be 101 years old, and until the week before he died at the end of November in 1981, he still frequented his Hollywood haunts of Musso & Frank and the Savings & Loan which he served as Chairman Emeritus. 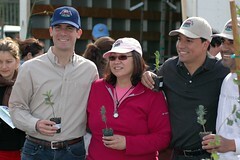 The Glassell Park Improvement Association, led by Laura Gutierrez (pictured in between myself and my colleague Jose Huizar) teamed up with TreePeople and the Million Trees Initiative to hand out more than 500 fruit and shade trees at the CD13 Satellite Field Office. Plum, peach, sycamore, and a host of other species were available to Glassell Park residents, who began lining up for trees before the hand out officially kicked off. Joined by Councilmember Huizar (who represents the eastern part of Glassell Park), I helped community members pick up the tree of their choice, a bag of mulch, and a few tips on caretaking. We'll nurture these trees, which in turn will clean our air and beautify our streets. In that act of planting and caring for them, we'll each commit ourselves to nourishing our community. Modern-day slavery still exists - in the form of human trafficking. Each year, thousands of immigrants are brought to the United States against their will and forced to work in unimaginable conditions. I joined Councilmember Tony Cardenas, members of the LA County Board of Supervisors, Sheriff Lee Baca, and Chief William Bratton in marking the National Day of Human Trafficking Awareness, a day dedicated to raising awareness about a problem little noticed by the public. Los Angeles has been a pioneer in combating the practice of human trafficking: our metropolitan task force is the first of its kind, a joint effort of law enforcement and community-based organizations, working together to assist victims and prosecute offenders. Furthermore, we are the first city in the nation to have a shelter dedicated solely to trafficking victims. You can learn more by visiting the Coalition to Abolish Slavery and Trafficking (CAST) website. To report human trafficking, call the hotline at (800) 655-4095. There's been a lot of talk about violence in Los Angeles this week. First, the City Council-commissioned report on a Citywide Gang Activity Reduction Strategy was released on Friday. Written by Connie Rice and the Advancement Project , this 108-page report is a pathbreaking call to action that invokes the need for the city to enact a "Marshall Plan" to solve gang violence in Los Angeles. It is one of the most significant documents to be produced in this city in years. I encourage you to come down to City Hall next week on Wednesday at 4pm in council chambers for hearings on the report. You can get a copy of the agenda by clicking here. If you cannot make it down, it will be televised on Channel 35 or you can watch on-line or listen in by calling Council Phone. Second, my colleague Janice Hahn's efforts to bring lasting peace to the Harbor Gateway area of her district (where she was joined by the mayor yesterday), are a sobering reminder of how far we have to go to ensure all Angelenos feel safe and young Angelenos have opportunities beyond gang membership and violence in many areas of our city. As you will remember, while overall crime is down in Los Angeles, gang crime increased last year, and the challenges in Harbor Gateway are felt throughout Los Angeles. Bobby Kennedy, of course, was himself taken from us by violence some two months later in Los Angeles. Martin Luther King, Jr. would have been 78 tomorrow. His vision of non-violence, justice, and equality is as needed today as it was decades ago. Let us not just commemorate the man and his vision for America, but let us make that vision a living history for us today. DRC Emergency Services is an Alabama-based disaster company whose emergency construction and disaster management services were employed in stabilizing New Orleans after Katrina. I joined Mark Stafford, a vice president from their company, at a ceremony outside of the Hollywood Division police station where he presented 100 bikes to the Hollywood Police Activities League (PAL), ably represented by board member Kerry Morrison and three girls who participate in PAL. Hollywood PAL provides young people with positive alternatives to gangs and drugs. Their youth program has been so successful that DRC decided to reach across the country and offer their aid in helping to brighten the future for Hollywood’s children. The gift of a bicycle—precious in the Hollywood flats, whose low incomes and often-cramped conditions reflect a different reality than the one we usually associated with the name "Hollywood"--means more than hours of exercise and enjoyment. Riding a bike teaches a different way of seeing your neighborhood, your city, and your community. A few riders will make it to the beach. A few will make it to the mountains. Maybe a few will make it to the Tour de France. Maybe they will see their bikes not just as a once-in-a-while activity but, as they grow up, part of their commute to work. Hollywood has already begun its transformation into a walkable community, and these bikes are a symbol of where their community, and the city, is going. Transportation costs can often be a limiting factor for seniors on a fixed income. One of the ideas that came out of Public Safety Summit a few months ago was the creation of a taxi voucher and bus token program for seniors, a suggestion brought to my office by the Glassell Park Seniors. Now, my office will be offering free taxi vouchers and bus tokens once a month to all seniors. You can pick up the vouchers and tokens at the Glassell Park District Office – the first give-away will be this Friday, January 12, from 9 to 11AM, and look for updates for future give away dates. My office is always looking for programs and ideas that will let CD13 residents feel safer in their neighborhoods and find independence in their lives. What’s your idea? 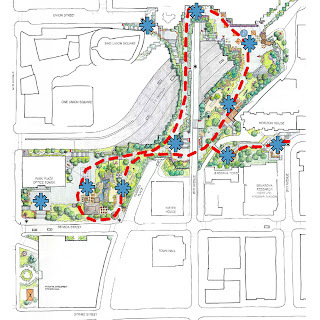 A few days after we passed the motion to begin studying a freeway cap park over the 101 in Hollywood, I found this article, which highlights similar moves around the country. On the right is a walking map of Seattle's straighforwardly-named Freeway Park, which started the craze in the 1970s. You can find more on that park here. Just in case you don't know, Ian Johnson is the son of LAFD Firefighter Sterling Johnson who works at Fire Station 47 in El Sereno. I'm not surprised. Congratulations to the proud parents, and the proud station. "Authorities Wednesday seized about a dozen dogs from an Echo Park home, where the animals were found living in "deplorable conditions," an animal-welfare organization reported. Humane officers served a warrant in the 1600 block of Morton Avenue and evacuated the dogs, according to Jeff Blodgett of the Society for Prevention of Cruelty to Animals Los Angeles." If you suspect that animals are being mistreated, please report these cases to Los Angeles City Animal Services or the SPCA/LA. Also, the Echo Park Animal Alliance does great work in Echo Park and surrounding neighborhoods. Alex Baum, who has a bicycle bridge over Los Feliz Blvd. 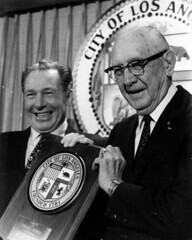 named after him (pcitured to the right), is the Chairman of the Los Angeles City Bicycle Advisory Committee. Read all about Alex, who is also a dear friend and is the grandfather of bicycle advocacy, in this profile in the Jewish Journal. A veritable Hollywood Central Park, the cap park will bring together communities that have long been separated by the snaking concrete of the 101 and will create open, recreational space in one of the park poorest areas in the nation. 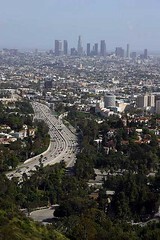 As Los Angeles has evolved, so has the 101 freeway, which began by connecting suburbs to the metropolitan area of Los Angeles and has since transformed into an-all-too-familiar scene of cars stuck in traffic, an image that is equated with life in Los Angeles. As we forge ahead into this century, the Hollywood cap park will become a symbol of the new Los Angeles, much as the gridlocked traffic was a symbol of the old - one in which communities come together to enjoy the natural environment that exists in the middle of our metropolis. Monica Howe, CD13 bicycle advocate extraordinaire, is profiled in the LA Times. (I would have added Nick's on N. Spring St., one of L.A.'s last diner counters). Crime is down again, but a candlelight vigil for the victim of an errant bullet and renewed focus on gang violence reminds of us of how much is left to be done. I helped kick-off MLK week celebrations at the California African-American Museum (which has a great exhibition, Intersections of South Central), and from the archives, this recording of a sermon given by Martin Luther King at my mother's synagogue, Temple Israel of Hollywood. A new vegetarian restaurant opens in Echo Park. Our great LAX executive director, Lydia Kennard, is going to leave the airport. We will all miss her tremendously. The gifted David Jansen, County Administrative Officer, is retiring, too. He gives us his thoughts on increasing the power of a future CAO. As long as we're talking county, should Los Angeles have two mayors? The Top Ten Environmental Stories of the Year. And, for fun, is your mind more male or female? Congrats to the USC Trojan Football Team, who dominated the Michigan Wolverines and snapped a two-game losing streak in the Rose Bowl (last year against Texas for the BCS Championship Game and this year against UCLA in the regular season), winning the 2007 Rose Bowl Game, 32-18. It was an incredible game, after a defense-dominated first half that ended with a 3-3 tie at halftime. The Trojans exploded in the third and fourth quarters, including a four-play, four-pass touchdown sequence by Quarterback John David Booty that showcased some of the best precision throwing I have ever seen in a college game. Then later, at home, I watched underdogs Boise State play Oklahoma in the Fiesta Bowl. This was more than a nail-biter; I say with all sincerity that it was probably the most exciting bowl game I have ever watched. After an improbable undefeated season, Boise State battled Oklahoma and the two teams scored a combined 22 points in the last minute and a half of the game to send things into overtime, where both scored, but Boise State bet it all on a two-point conversion and won. Then, to cap things off, I watched with America as Ian Johnson, the running back who won the game, got on his knees on live television and asked his girfriend, the head cheerleader at Boise State, to marry him. She said yes. 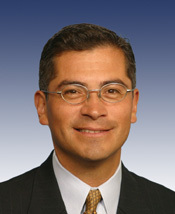 My good friend and my congressman, Representative Xavier Becerra, was named last month by Speaker-elect Nancy Pelosi to the senior leadership position of Assistant to the Speaker. Already an influential member of the powerful Ways and Means Committee that guides tax policy, Rep. Becerra will now be the highest-ranking member of the house from Los Angeles and the sole Latino member of Speaker-elect Pelosi's leadership team. I am very proud of Xavier and this can only be good news for the 13th Council District (a majority of which is represented by Rep. Becerra) and for Los Angeles. Combined with a California speaker, Los Angeles is in a much better position to lobby for our fair share of Washington dollars than we have been in decades. I feel very well represented by Xavier and his great staff. 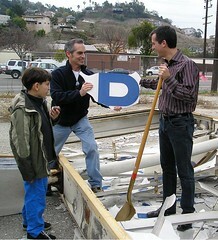 We work very closely with his district office, which has successfully helped bring federal dollars to supplement projects in the 13th Council District, from the renovations of the Echo Park boathouse, our new street lights in Elysian Valley (the first phase of which are nearly finished), and the streetscape improvements along Temple St. in Historic Filipinotown. Congratulations, Xavier, and here's to a great 2007 for Los Angeles in Washington DC!